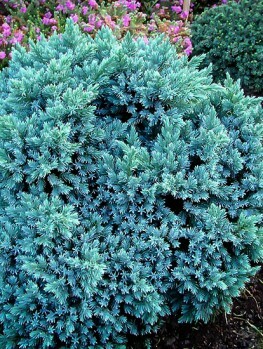 The Blue Chip Juniper Tree is a unique form of creeping juniper that cascades down in waves of blue foliage from a short trunk. The branches flow downwards, but the tips turn up, giving a special look to this lovely tree and making it ideal as a gift for anyone. 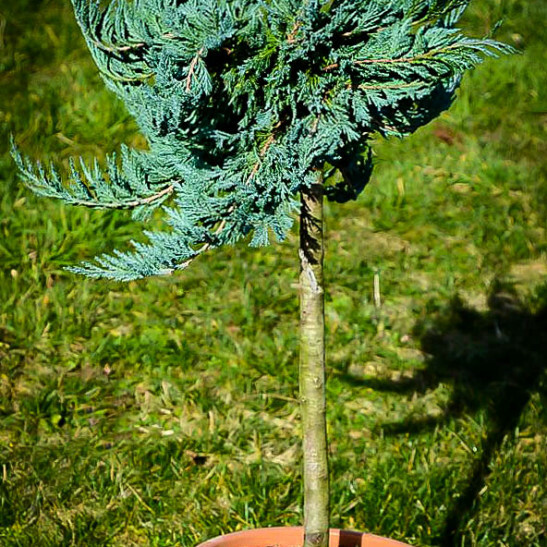 This tree is very hardy in both cold and hot conditions and will grow anywhere, so no matter where you want to send this plant, it will thrive. The healthy, steely-blue foliage will retain its color all year round, never turning green, and the more sun it receives the richer the color will be and the happier the tree will be too. Over time it will develop into a small tree about 4 feet tall, sweeping widely up to 6 feet, but it can easily be trimmed to keep it smaller if needed. This tree will thrive in sandy and rocky soil, tolerate all conditions from sea-shore to high-desert and inner-city pollution, thrive in heat and dryness, and yet survive snow, ice and freezing temperatures. It looks charming in any garden, or even in a pot on a terrace and can be used with other suitable plants to give an easy Asian feel to any area. 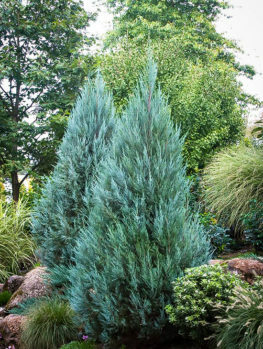 If you want to give a gift tree that is both unique and easy to care for, the Blue Chip Juniper Tree is an ideal choice. A tree does not have to be rare and exotic to make a great gift. Sometimes a special version of something well-known really fits the bill. After all, a proven plant with a track record of reliability and ease of care, but presented in a new and novel way is going to make a terrific gift tree, especially for a novice gardener, or someone who doesn’t have a lot of time, but wants an interesting and attractive garden. So with exactly that in mind, we had the well-known Blue Chip Juniper turned into a small tree, by asking our skilled growers to attach stem pieces to short sturdy trunks. 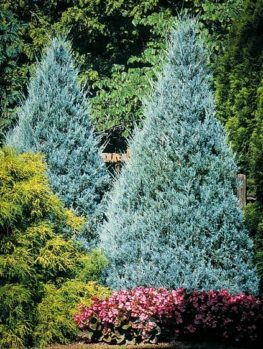 Created in this way, the Blue Chip Juniper Tree is a wonderful small tree for a small space, which will grow about 4 feet tall and spread to about 6 feet, although it can be trimmed as needed. 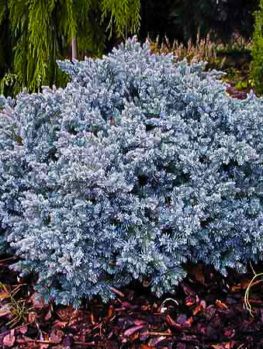 With stunning steely-blue foliage that keeps its color all year round, raising this plant off the ground allows it to cascade down, rather than spread flat, as is its normal way. So a beautiful cascading and billowing small tree is created, covering a good area with swirls of long branches with upturned tips. The Blue Chip Juniper Tree is winter hardy to minus 40 degrees, yet happy in high temperatures too, so it will grow right across the country. Once established in the garden it is also totally drought-resistant and thrives in full sun anywhere. It tolerates urban pollution, sea-shore conditions and grows in any kind of soil. It even grows well in high desert areas, tolerating the rapid change between hot days and cold nights. It is generally free of pests and diseases unless grown in shade and wet or poorly-drained soil. Indeed, it grows best on sandy or stony soil, because wetness is one thing it does not like. Even deer need to be mighty hungry before tackling a plant like this, but it is not very prickly and children are perfectly safe around it. 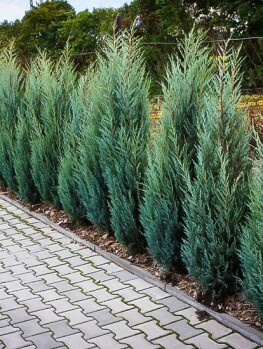 An excellent place for a Blue Chip Juniper Tree would be a sunny raised bed or a planter box, and it also works well in the foreground of larger trees and shrubs. On a patio or terrace it can easily be grown in a pot, where it will give some height, so you don’t even need a garden to enjoy this plant. In pots it has the advantage of surviving missed waterings, so it is ideal for the busy person. It also fits well into the popular Asian style of garden, without needing any special training, as well as into more conventional garden styles. Over time the tree will become a broad, spreading mound, but the tree-form can easily be retained, and the tree kept smaller, by trimming. 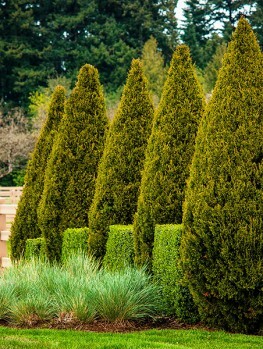 Don’t clip it over with shears, but shorten the long branches, always cutting at an upward-turning stem, so as to keep its special sweeping appearance. The Blue Chip Juniper Tree was bred from a native American plant, the Creeping Juniper (Juniperus horizontalis), which can be found growing wild in northern areas and up into Canada. It lives naturally in sandy and rocky places, so it is naturally tough. The wild plant has blue-green leaves and forms mats across the ground 12 to 18 inches tall and up to 10 feet across. It was taken to Britain and Europe in the early 19th century and became popular in Scandinavia for its hardiness. 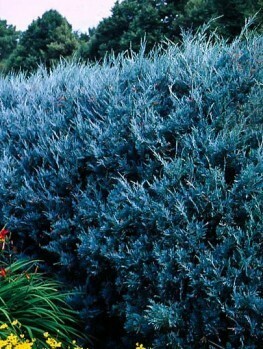 It was there, in Denmark, in the 1940’s, that the Jensen Nursery found and developed ‘Blue Chip’ for its strong foliage color, low and broad habit and dense growing pattern. Since then it has proved a valuable, highly recommended and popular plant across the world. So for the perfect, reliable gift tree, full of charm and toughness mixed together, choose the Blue Chip Juniper Tree. You can be sure the person you are gifting will enjoy it immensely and be grateful you have not burdened them with a tree requiring special care and attention. 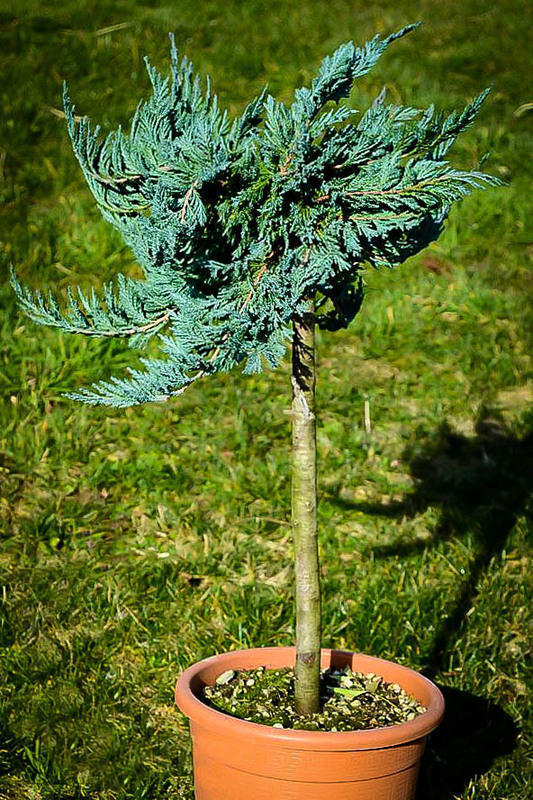 This plant is rarely available in this unique tree form, so our stocks are strictly limited. Order now to give the perfect gift tree to someone you love and care for. You may also want to consider another popular variety that also makes for a great gift, the Spartan Juniper.